In World War One, the Ottoman Empire was one of the defeated powers and its capital, Constantinople, was occupied by the victorious allies – France, Great Britain, Italy. But for the Russian Revolution, Russia would have been there too. Even if Russia was not, Russians were: “White” Russians who had the sympathies of the victorious Allies could make their way across the Black Sea and seek refuge in Constantinople. Many did. Until end 1920, the Civil War in Russia continued with White forces still controlling areas in the south and mainly around the Black Sea. 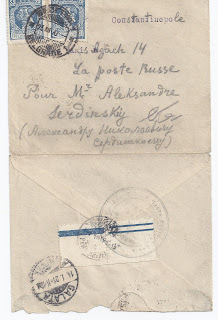 It was even possible to send mail abroad from White areas and that mail went via Constantinople, where an improvised Russian Post (not ROPIT) based in the Pera district received it and transferred it to the Turkish postal system. A transit mark was genuinely used on such mail and I have illustrated it on this Blog on 8 October 2016 - thereis a lot of background information there. 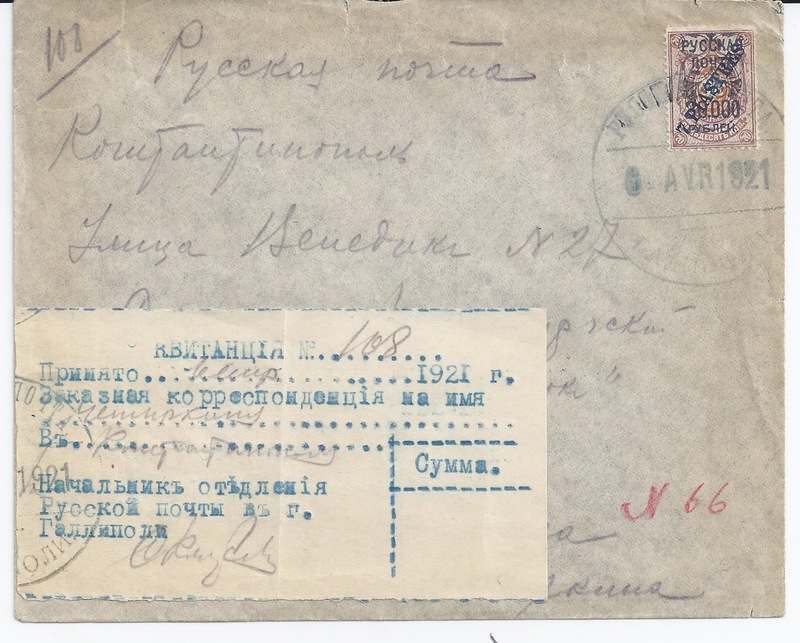 When the last White forces evacuated from Crimea at end 1920, there was no more mail for transit. But there were now many more refugees in Turkey. 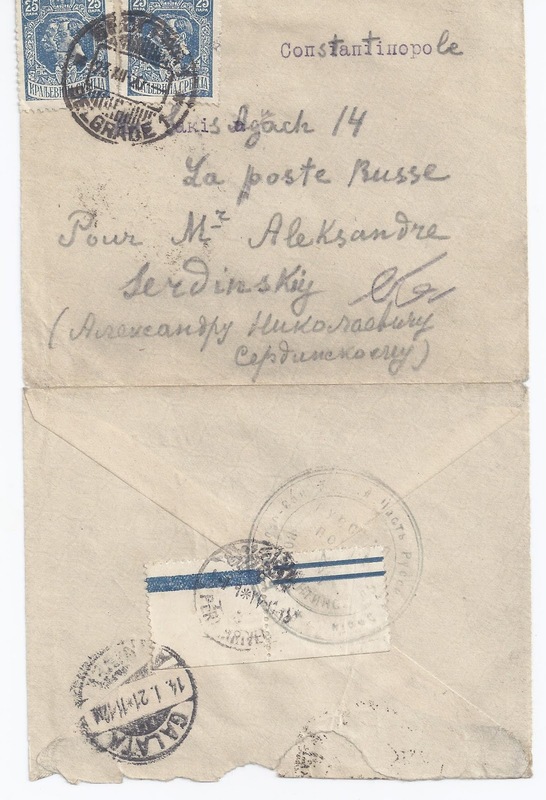 Someone had the idea that a Russian Refugee Post could replace the Russian Post and, though it did not happen, an elaborate scam did happen, headed up by Alexander Sredinsky, the existing Postmaster who later became the stamp dealer Thals in Paris. 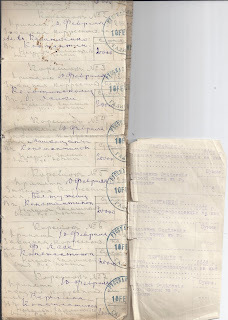 But you could not take a letter to Sredinsky and have it sent through the Russian Post, nor could you do that in any of the refugee camps around Constantinople. But an elaborate scam tried to prove that you could. Here for example, is a book of Registration receipts supposedly used at Gallipoli. It contains 199 receipts. 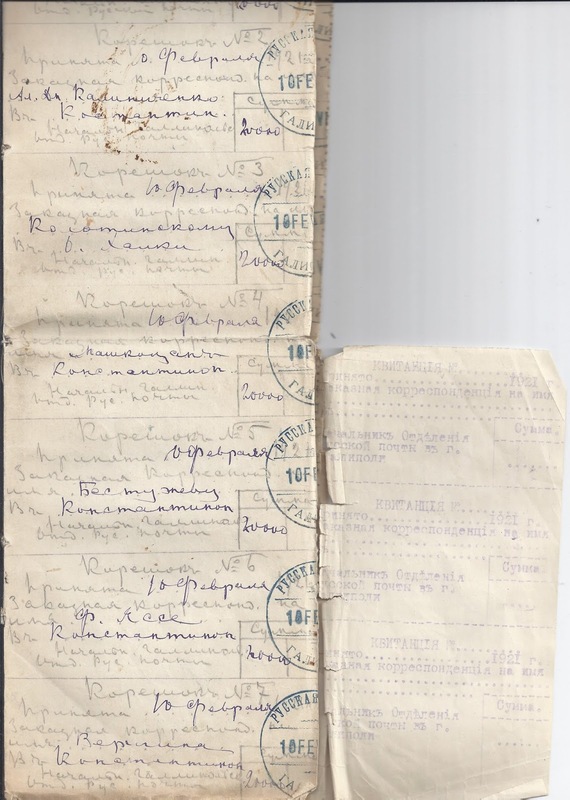 Of these, 196 have been filled out and the KVITANTSIA part at the right removed and supposedly given to the sender. Three complete unused forms remain at the end. Remarkably, there exist letters which correspond to the receipt book. Here is one with its No. 108 Kvitansia attached and which matches the half coupon remaining in the Receipt book. Amazing. 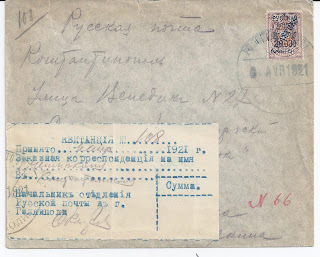 But the fact that the Kvitansia is attached to the April 1921 cover is the give away: this is what you did in those days with a philatelic cover which you had fabricated, normally slipping the receipt inside the letter as proof of its original posting. Serebrakian did it with the letters he sent from Yerevan to his brother in Tiflis. It implies, at the very least, that the letter was not sealed until it had been Registered. In this case, I don't believe the letter was ever in Gallipoli or carried from there to Constantinople. But a big effort has been made to convince me - and many people were convinced. The stamps of the Refugee Post got into all the catalogues and commanded high prices before 1940. In my view, this letter started out on Sredinsky’s desk in Constantinople where both the GALLIPOLI despatch cancel and the CONSTANTINOPLE arrival cancel were applied. But what a remarkable effort to convince us otherwise: a 199 coupon Registration receipt book!